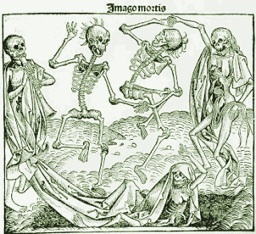 Death leads in this dance, popular in the Middle Ages when people were dying like rats; with rats; oh, rats! It was introduced in allegorical form in 14th Century religious texts as a warning or maybe a whistle through the pervading darkness. Imagine the shake, rattle and pop as all those skeletons shimmy away in the graveyard. Or, you could picture it as a far more somber procession, as many an artist did, with the Great Equalizer leading the high and mighty, the lowest of the low, the young, the old, the pope, the beggar, to their graves in a ghastly conga line. The moon has swathed all in a silvery light. The churchyard, like day, seems to glow. Trailing grave clothes and shrouds, white as snow. 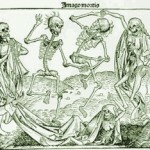 But a danse macabre, a totentanz, a dance of death, must have music! For that I give you two of my favorites: Franz Liszts’s Totentanz or Saint-Saëns’s Danse macabre. Oh, the music—especially Enrico Pace playing Franz Liszt! I swoon. I die. I dance.